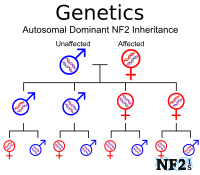 Scientists have determined that NF2 nerve damage that results in damage to the brain, senses, muscles or organs is not just a result of tumor burden but tumor growth rate and damage to the nerve itself from Axon connectivity. Tumor developments can result in massive bodily damage and can be fatal if ignored. 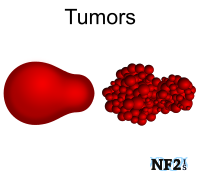 While some people with NF2 only have only a few tumors, others might have hundreds. The resulting damage of each tumor can also be the result of treatments necessary to stop tumors from growing beyond life critical sizes. With Central Nervous System tumors; tumors on or near the Cranial Nerves in the brain or nerves extending from Vertebrae from the Spinal Cord, each nerve can be associated with multiple functions, therefore, damage can affect; senses, muscles and even organs. Cranial Nerves, are particularly sensitive and when damaged have much less chance to heal than nerves in any other area of the body, even after minimal damage. Therefore, when cranial nerves loose circulation, due to the development of a tumor either pushing on, or on nerves in the brain, the nerve rarely heals and unlikely to heal 100%. Everywhere else in the body the nerves can typically take up to six months to completely heal. Nerves in the brain have a much less chance to heal correctly than nerves in any other area of the body, even after minimal damage. 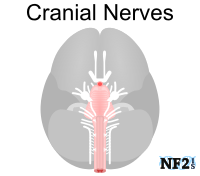 There are 24 Cranial Nerves, 12 pair of Cranial Nerves in the Central Nerve System, a left and a right nerve for each. 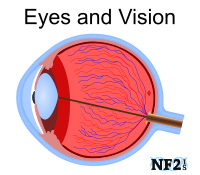 Each Cranial Nerve controls specific muscles or senses, some control both. Damage to any part of this nerve should not result in facial movement issues. Facial movement is the result of CN7, the Facial Nerve. 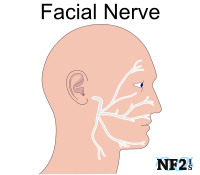 The Facial Nerve primarily controls; eyelid movement, lip movement for eating and talking, as well as facial expression. The facial nerve can easily be broken or otherwise weakened, during treatment management of Vestibular Schwannoma. 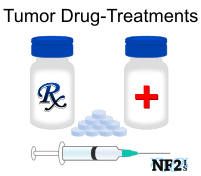 There are different treatment techniques surgery, radiation and chemotherapy trials for different approaches to manage tumors. Options are often based on; exact tumor location, tumor size, a tumors shape and rate of growth, in addition to; an individual's age, height, weight and general health. Some of the different treatment options can ultimately lead to damage to the facial nerve. 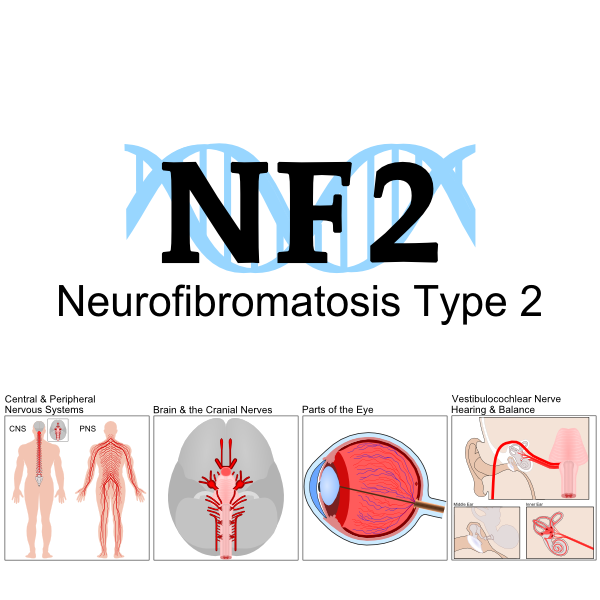 While hearing loss and hearing issues are not the only issue people with NF2 face, it is the one issue 90 percent of people with NF2 develop, with all the other possible issues varying for a variety of reasons. Tumors typically grow on the Vestibular Nerve but growth on either the Vestibular Nerve or the Cochlear Nerve typically results in damage to both and therefore hearing and balance are lost at the same time. Spinal Cord Compression results in Spine Damage and can include Loss of Mobility. 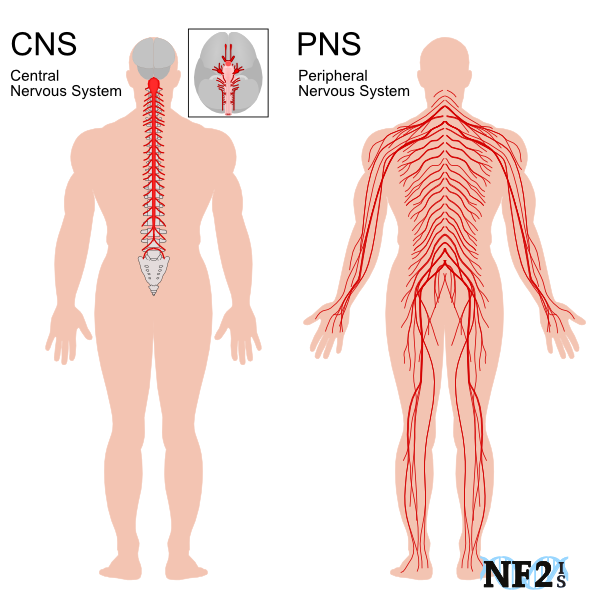 Tumors in the spine can damage the PNS (Peripheral Nervous System) and depending on how extensive the damage is to the nerves it can result in Spinal Cord Compression. Spinal Cord Compression is damage to nerves in the spine that will result in issues without the Somatic Systems and Autonomic Systems. The Somatic Nervous System is part of the peripheral nervous system, which controls muscles and movement in different parts of the body. The Autonomic Nervous System affects organs. Problems an individual would develop would be based on the location of the tumor in the spinal cord. If your body is always cold or doctors have a hard time finding veins for IV injections you may have a circulation problem. 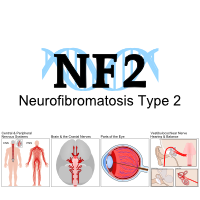 Circulation issues are not uncommon amongst people with NF2, it is one of the signs of Peripheral Nerve Damage. 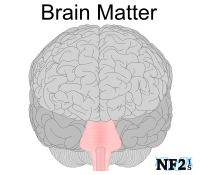 For individuals with NF2, Schwannoma tumors damage to Central Nervous System is a common occurrence. This would include the Cranial Nerves in the brain. Tumors growth and treatments in different areas of the brain can result in issues in addition to nerve damage, even if only from brain matter compression.